VAILS GATE, NY -- The world's oldest barber is still going strong in Orange County, and on Wednesday, he celebrated his 105th birthday. 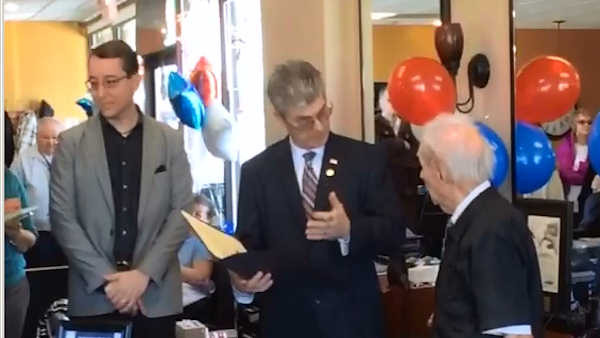 Anthony Mancinelli celebrated the occasion with a cake, and was honored with a proclamation from Orange County legislators. Anthony was asked recently what he would be doing on his birthday, and said he would spend it like any other day: "Come to work." Rob Nelson has the story of the world's oldest barber, still on the job in Orange County. Anthony started cutting hair at the age of 12, back when Calvin Coolidge was in the White House. Now he is the oldest working barber in the world, with no plans to retire. "Hours don't matter with me, I don't get tired, I just keep going," he said. "His work is wonderful, he's got a heart of gold, he cares about the clientele, he cares about people," said Jane Dinezza, the owner of Fantastic Cuts in New Windsor where Anthony works. "It's amazing, it's hard to believe he's still going on. He's in better shape than I am," said his 79-year-old son Robert. Anthony still works at least 5 days a week, still drives, lives alone, and still cuts his own hair.